Cite page (MLA): Ward, Megan, and Adrian S. Wisnicki. "Field Diary IV: An Overview." In Livingstone's Final Manuscripts (1865-1873). Megan Ward and Adrian S. Wisnicki, dirs. Livingstone Online. Adrian S. Wisnicki and Megan Ward, dirs. University of Maryland Libraries, 2018. Web. http://livingstoneonline.org/uuid/node/df7c40c8-c422-4120-a915-59c9c153cb58. This page introduces Field Diary IV, which is part of our critical edition of Livingstone's final manuscripts (1865-73). The essay analyzes Livingstone's dominant concerns: the slave trade and his authority struggles with porters. The essay concludes with notes on the material form of the diary. Field Diary IV further develops two of Livingstone's main concerns: his relationship with his men and the Arab slave trade. The account is riddled with concerns over his authority and complaints about his porters' behavior, including instances of rebellion and illnesses that Livingstone deems fake. Livingstone most often singles out the sepoys and compares them unfavorably to his African porters, but there is one crime that all of his men seem to commit: stealing. At one point he refers to "a general stealing by the sepoys & others" and concludes, "This is very distressing" (Livingstone 1866c:). Indeed, the back of the diary includes a list of items stolen - including cloth, food, and gunpowder - and the perpetrator for each one (see below). Two images of pages of Field Diary IV (Livingstone 1866c:, ). Copyright David Livingstone Centre. Creative Commons Attribution-NonCommercial 3.0 Unported. The page at left (top in mobile) discusses theft by Livingstone's men, while the page at right (bottom) includes some of Livingstone's most graphic illustrations of the murderous results of the slave trade. As Livingstone and his men make their way toward Lake Nyassa, he also notes the continued encroachment of the slave trade. Though he has fewer direct encounters than in Field Diary III, he finds a strong sense of the Arab influence on the African populations. For instance, he notes that the Waiyau people "imitate the Arabs in dress and chewing tobacco & 'nora' or lime instead of betel nut and lime" (Livingstone 1866c:-). In addition, Livingstone describes and illustrates the huts in Mataka's village, which are built "square in the Arab fashion" (Livingstone 1866c:). As in previous works, Livingstone also critiques the Africans for kidnapping and selling one another into slavery. He records the slave trade's atrocities, as evidenced by the image below, which depicts the bodies of slaves who were abandoned, tied to trees, on their march to the coast. Two images of pages of Field Diary IV (Livingstone 1866c:, ). Copyright David Livingstone Centre. Creative Commons Attribution-NonCommercial 3.0 Unported. The page at left (top in mobile) includes drawings of the huts in Mataka's village, while on the page at right (bottom) Livingstone draws the Tsenga (also Senga) hills and the profile of a local headman. Yet, here we also find one of the primary tensions present in much of Livingstone's later writings: though he criticizes the African complicity with the slave trade, Livingstone, too, depends upon the Arabs. In the final section of the diary, he struggles to rent a dhow (a type of boat) from Arab traders, who first promise it to him but never furnish it, prompting him to turn unsuccessfully to a local headman: "Dhow people playing me false - afraid of me probably as all the slave traders have been" (Livingstone 1866c:). 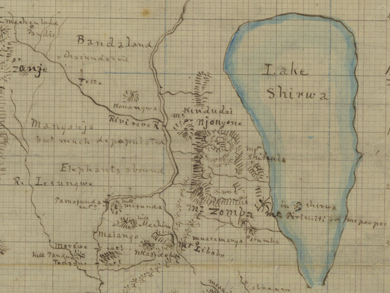 Livingstone requires the dhow because he has reached the shores of Lake Nyassa, the high point in this diary. He reports that it is "Pleasant to hear the roar of the sea and bathe in the rollers I feel exhilarated exhilarated [sic] as if I had come back to an old home which I did not expect again to see" (Livingstone 1866c:). The food shortages experienced earlier on the trip are rectified here; "with milk," he concludes, "I feel 'in clover" (Livingstone 1866c:). Field Diary IV appears to be the same kind of book as the previous three field diaries: side-bound, covered in green silk that has become ragged with time. It is mainly written in grey pencil, with a few additions or corrections in blue pencil or black ink. As in previous diaries, Livingstone writes from both sides of the book at once, so the final twelve pages are written upside-down in relation to the rest of the text. Two images of pages of Field Diary IV (Livingstone 1866c:, ). Copyright David Livingstone Centre. Creative Commons Attribution-NonCommercial 3.0 Unported. The page on the left (top in mobile) combines narrative prose with calculations. At the foot of the page on the right (bottom), Livingstone enumerates the thefts committed by his men. This final section includes maps, drawings, lists of local chiefs, names of surrounding ethnics groups, and the aforementioned list of stolen items. Though there are mileage counts and calculations sprinkled throughout, this final section seems to serve as the primary repository for most of Livingstone's references and notations.